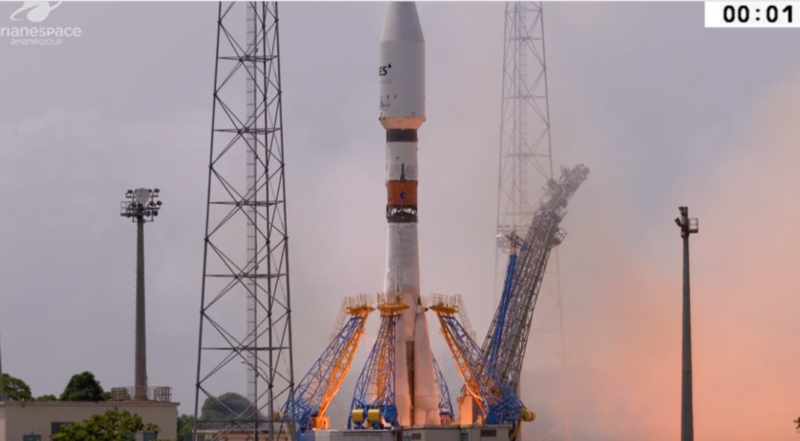 An Arianespace Soyuz launches from the Guiana Space Center March 9 with four O3b satellites. Credit: Arianespace video still. WASHINGTON — A Soyuz rocket from Arianespace successfully delivered four telecommunications satellites into medium Earth orbit for fleet operator SES. The rocket took off from Europe’s spaceport in French Guiana at 12:11 p.m. Eastern March 9 after a 33-minute delay caused by high altitude winds. The four 700-kilogram satellites separated from the rocket’s upper stage two hours after liftoff in pairs 20 minutes apart. The launch is Arianespace’s second launch of the year and first since an inertial navigation system with incorrect launch data led an Ariane 5 rocket slightly off course in January. Arianespace said at the time of the Ariane 5 investigation that future missions were proceeding as scheduled. However, on March 5 Arianespace chose to delay the Soyuz launch by three days for “additional checks at the Guiana Space Center (CSG) as part of the resumption of launches,” according to a company statement. Spokesperson Aaron Lewis declined to say if they delay was related to the European Space Agency’s recommendation that Arianespace vet launch documents and mission parameters more diligently before launching. Luxembourg-based SES now has 16 high-throughput Ka-band satellites circling the Equator at an altitude of 8,000 kilometers, about one fourth the distance from the Earth as geostationary orbit, where most telecommunications satellites operate. SES took full ownership of O3b in 2016, pairing O3b’s MEO satellites with its GEO fleet. SES was an early investor in O3b back in 2009, four years before the company had any spacecraft in orbit and when the idea of putting broadband-optimized satellites in MEO instead of the traditional geostationary orbit faced substantial industry skepticism. O3b has championed MEO’s lower latency, or lag time, as an advantage over GEO. In a post-launch speech at the CSG’s Jupiter control room, SES Chief Technology Officer Martin Halliwell said the four new satellites should enter service May 17, increasing the capacity of the O3b fleet by 38 percent. The new satellites also increase O3b’s reach by five degrees further from the Equator, up to 50 degrees north and south latitude. Halliwell, an SES employee for 31 years and CTO for the past seven, said he plans to retire next year, and that today’s launch will likely be his last visit to the CSG. The four satellites launched today are part of an eight-satellite order O3b Networks made in 2015 to incumbent supplier Thales Alenia Space, prior to SES ownership. The other four satellites launch early next year, Halliwell said, on another Arianespace Soyuz. Those satellites will compete the first-generation O3b constellation. SES placed an order in 2017 with Boeing for seven second-generation satellites for a constellation called O3b mPower, designed to deliver 10 terabits of throughput. O3b mPower is scheduled to start launching in 2021. SES has not yet selected a launch provider for the O3b mPower satellites.